Masking tape, also known as painter's tape, is a type of pressure-sensitive tape made of a thin and easy-to-tear paper, and an easily released pressure-sensitive adhesive. It is available in a variety of widths. It is used mainly in painting, to mask off areas that should not be painted. The adhesive is the key element to its usefulness, as it allows the tape to be easily removed without leaving residue or damaging the surface to which it is applied. The tape is available in several strengths. We are one of the reckoned names in the industry as the manufacturers & suppliers for Masking Adhesive Tape from a vast number of years. All our products are manufactured with the usage of good quality raw materials and cutting edge technology by our team of expert professionals. Also, tested on various defined parameters so as to assure its quality. 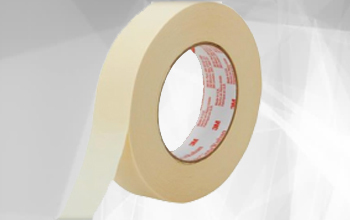 Masking Adhesive Tape are designed for superior performance in a variety of applications such as paint masking, holding, light-duty, splicing, bundling, packaging and many more.